The work requirements were the same as before. 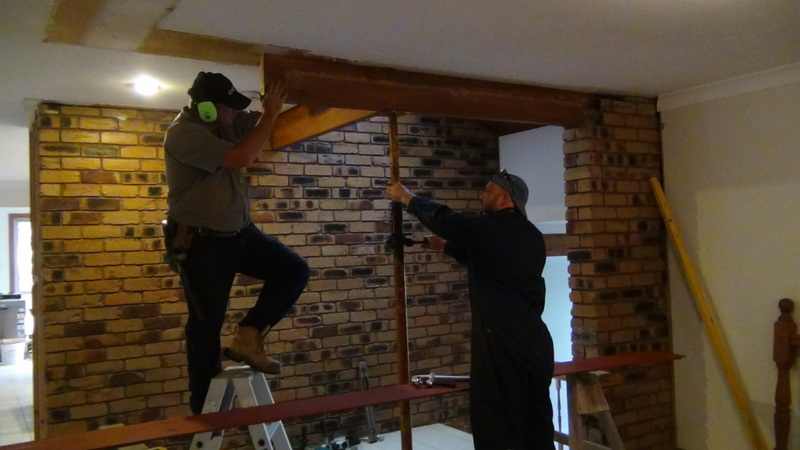 Plate up the existing beam and support it by two posts. The client borrowed one of my acro props and supported the structure as you see it. 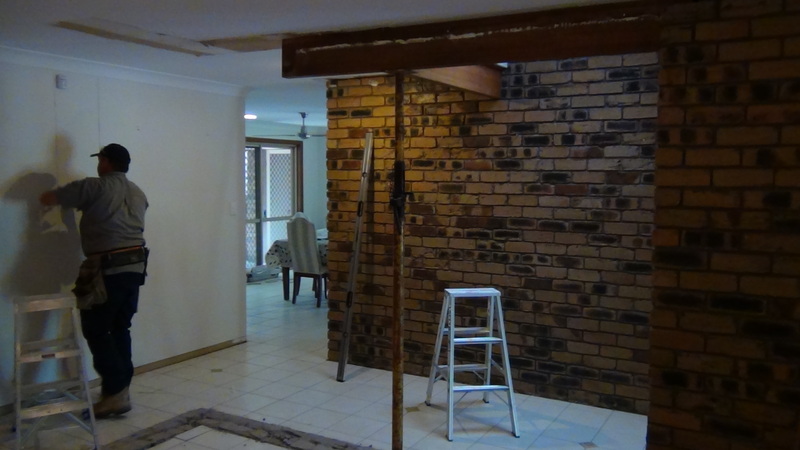 He then demolished the load bearing brick wall. All this was done after an engineer was contracted by him to re design the structure. I ordered the flat bar from my mates’ engineering shop, had it cut and the edges lenished. On site we remeasured the lengths and primed the steel with an oxide undercoat. Steel posts were cut to size and plated top and bottom. 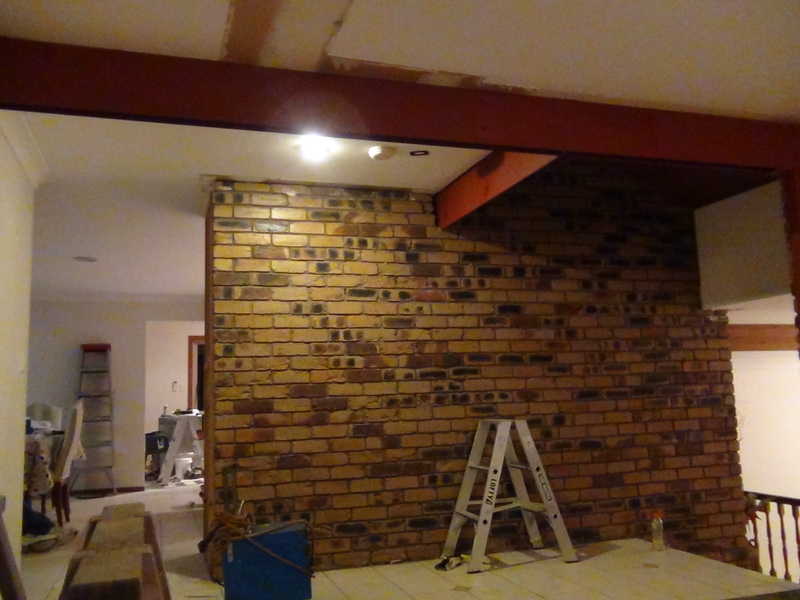 The existing beam was plated in stages and then welded. Where the existing beam ended we laminated two lengths of pine the same size and used it as a packer. This was to prevent the steel from buckling or distorting when we were tightening up the bolts and when the building load would be applied. The holes were marked, drilled and bolted. The post were bolted and welded to the steel plates. Finally we re painted the areas where I welded. As you can see, all done. It is supporting the bedroom upstairs. It took three of us nine hours to do. Unfortunately we started late because I was picking up materials. 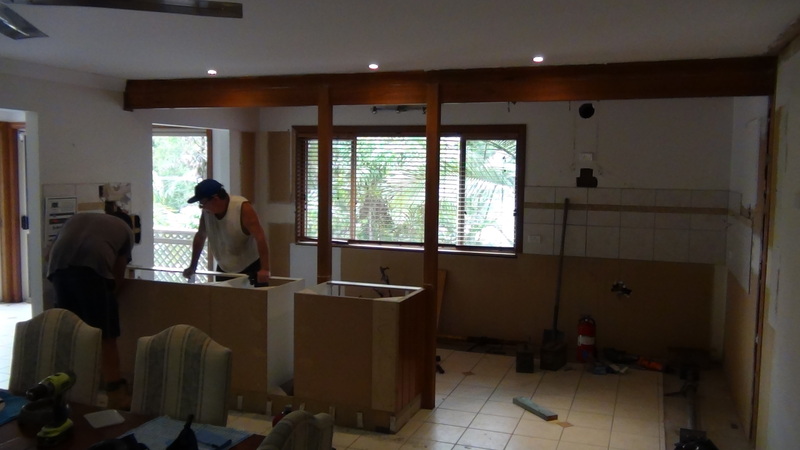 Started around 12 noon and finished the job at 9pm in the evening. The client is nice and was cool about it, actually he was happy to have it done and so was I. 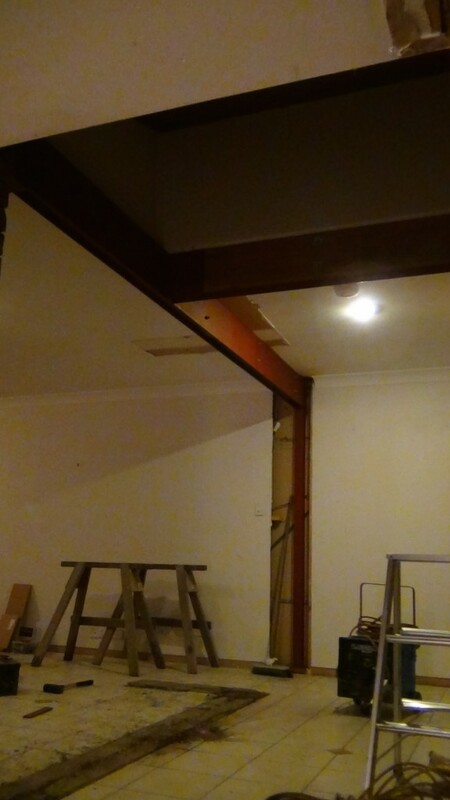 We were instructed by the client that they wanted to remove two load bearing posts that were supporting the upstairs bedrooms. 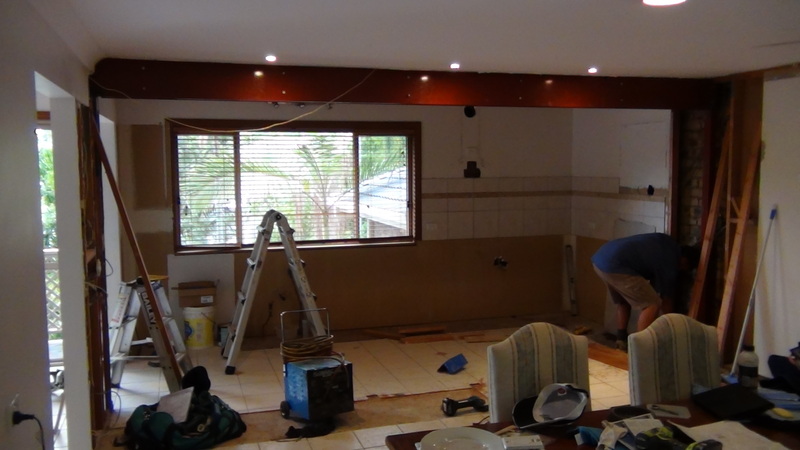 They wanted to have more of an open plan kitchen and dining room. Once the quotation was approved, I ordered the steel and had it fabricated to the engineers specifications. The posts had to be cut and welded on site as we wanted to be spot on with the heights. Sometimes you get deflection in pre existing beams and you need to get the levels right before you make alterations. 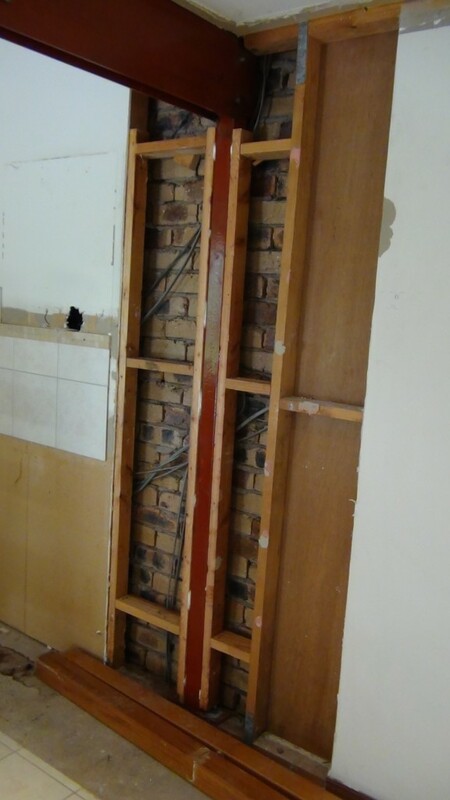 Below is a photo showing you the nice fit of the steel post inside the wall cavity which also acts as a tie down. 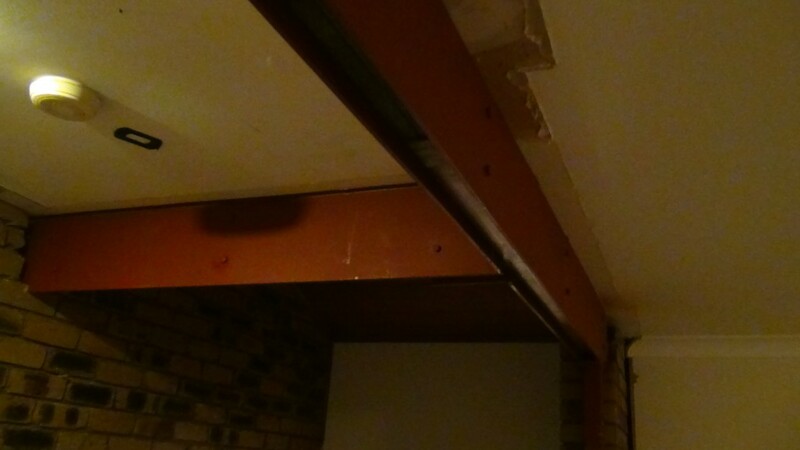 The heavy plated steel was plated on each side of the beam and the posts were cut and welded into place and bolted up. Everything was painted and ready to be sheeted over. There was no deflection at all. The job went like clock work, the customer was happy and it was mission accomplished. You always need to treat each job differently and you must always exercise caution. We were totally prepared before we started but we also had contingencies in place.